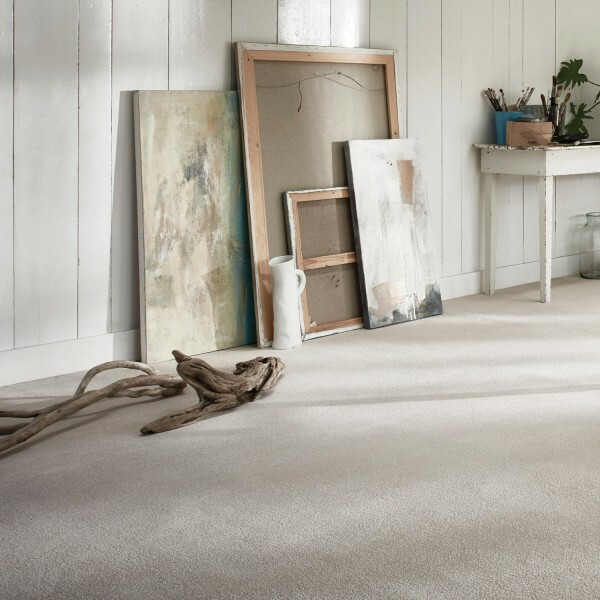 Thanks to its super softness and excellent hardwearing qualities, as well as being very reasonably priced, the Invictus Plains range of premium saxony carpet from Associated Weavers is one of our staple bestsellers. And the colour choices in the range have recently been updated with more on-trend neutrals, pastel undertones and grey hues to choose from too! The thicker of the two broadloom carpets available in the Plains collection is Invictus Sirius, which at 70oz is every bit sumptuous underfoot and performs exceptionally well. Made from polypropylene, it’s stain resistant, bleach cleanable and comes with an impressive 20-year stain warranty, which is great considering other good quality polypropylene carpet manufacturers offer one for half that, at ten years. Alongside it, in the same style and choice of colours although a lighter pile weight, is Orion at 50oz. For the sake of the few pounds per square metre difference in price, our customers often opt for the extra luxuriousness of Sirius. Invictus Sirius and Orion are woven from several unique shaped, 100% solution dyed polyolefin (high quality polypropylene) fibres, which give the carpets their outstanding bulk, softness and shine. As we mentioned earlier, Associated Weavers have given the Invictus Plains collection a little colour palette overhaul. Some of the creamy, bluey colours have been discontinued and replaced with the more on-trend pastels that are fashionable today within interiors and work perfectly to co-ordinate with a variety of style schemes. New colours include ‘Grey Plank’, the elegant ‘Egyptian Papyrus’, an intriguing very light grey in ‘Lavastone’ and a fabulous, ever so soft, dusky pink with ‘Carnation’. With the Invictus Plains collection, all the carpets come in one dyed colour. If you’re looking for an option with a fleck, then the Invictus Heathers collection will suit better. There you can find the same level of high quality polypropylene carpet in a soft twist pile with the 70oz Pegasus and 50oz Perseus collections. Showing: Invictus Sirius 70oz high quality stain resistant carpet in Carnation, an on-trend pastel shade. As well as the very competitive price per square metre for a high quality, soft, stain resistant carpet that the Invictus Plains collection offers, there’s the added bonus of a greater choice of widths too. The Invictus Plains and Heathers collections are available in 2, 2.5, 3, 4 and 5m widths, which is ideal if you are looking to carpet narrow spaces as much as larger ones. The extra choice of widths can make a difference to the overall price of your carpet installation if it means less waste. With Flooring 4 You being an official retailer of the Associated Weavers carpet products, we can provide their products in all the widths available. It’s worth bearing in mind that not all carpet retailers can do this as they don’t deal directly with the manufacturer. Showing: Invictus Plains Orion 50oz high quality stain resistant carpet. 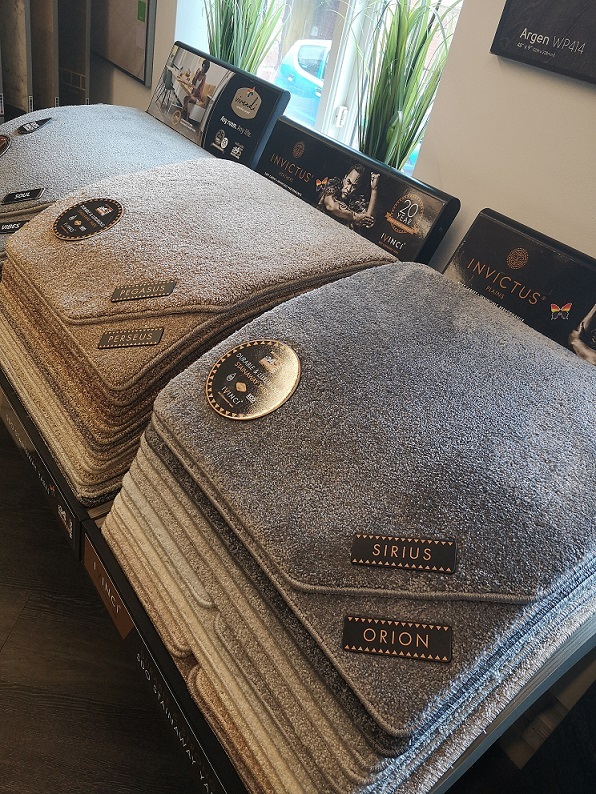 With its excellent performance qualities, we recommend the Invictus carpets for busy homes where there might be heavy traffic areas, children, pets or the odd spillage. Whether installed to the hallway, lounge or stairs, they are as robust as they are luxurious and will stand the test of time better than some of the other polypropylenes on the market. 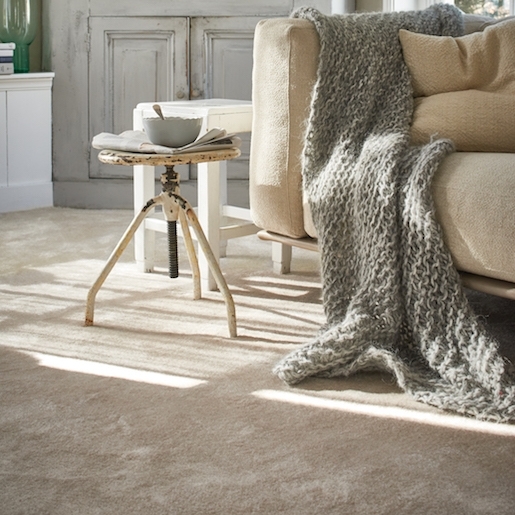 Taking care of the carpet is important too, to maximise life and performance. The manufacturer recommends they are professionally cleaned every two years, to keep their softness, shape and lustrousness for years to come. Showing: The Invictus Plains carpet stands at our Knutsford showroom, complete with the new colour samples. The Invictus Plains carpet collections start from £19.99m2 and are available from Flooring 4 You in the full choice of widths available. You can see all the samples at our Knutsford and Bowdon showrooms and loan swatches to take home to try within your space. For a free quotation for Invictus Plains for your home, send us an email or give us a call today to arrange a convenient date and time.